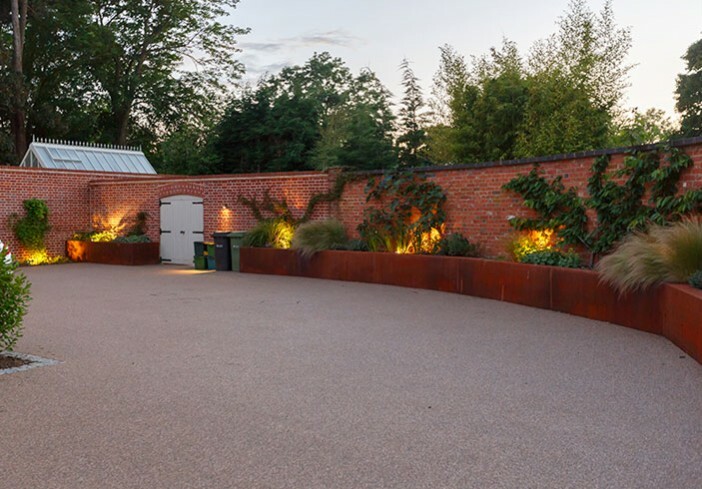 BALI ‘Design Excellence’ Award Winning garden emerges from a quagmire; landscape designer Anthea Harrison creates a modern oasis in Hertfordshire. 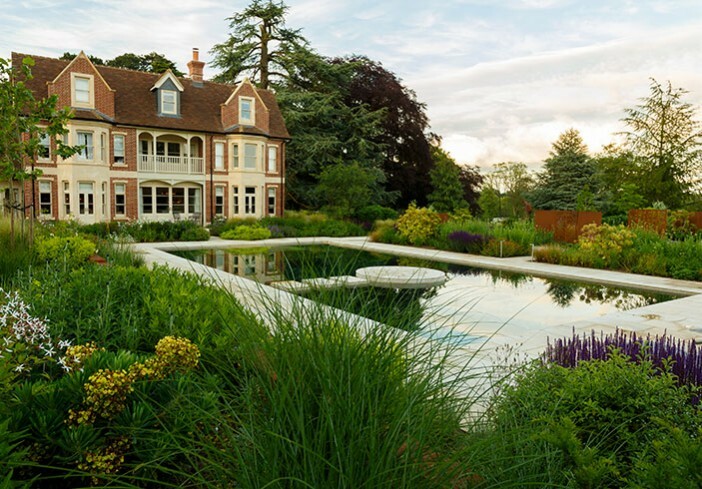 Anthea Harrison’s brief was to transform the development site near Wheathampstead into a magnificent garden with swimming pool. 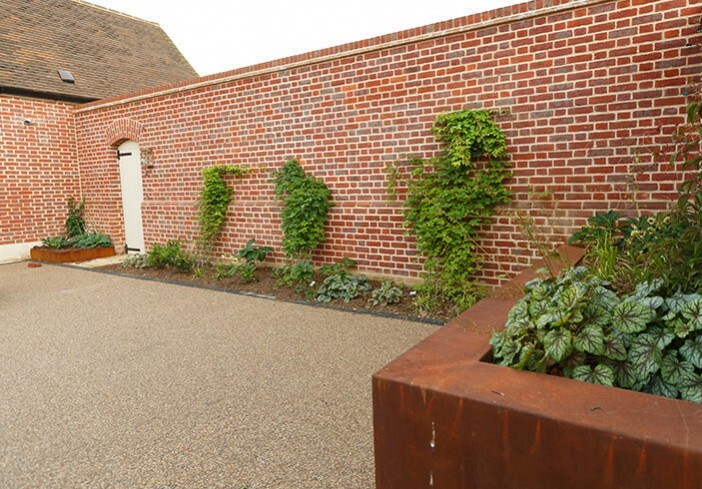 Her clients, passionate gardeners and Chelsea Flower Show attendees, had high expectations. With a house to be demolished, a new home built, excavation for basement and swimming pool and several trees with preservation orders, the original site was a bit of a challenge. 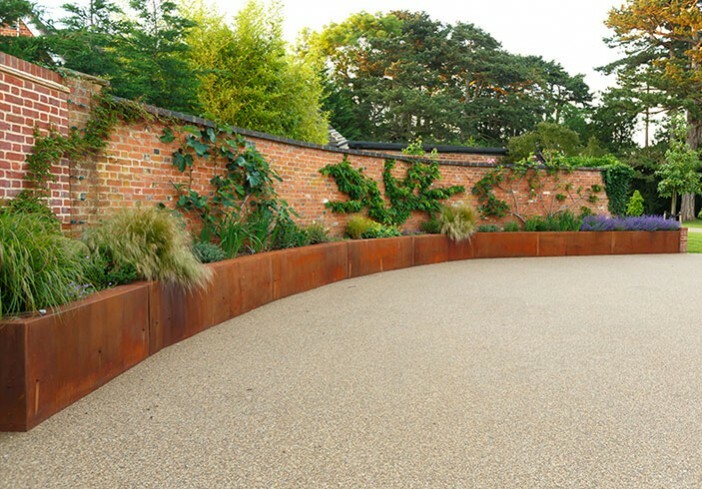 From this rather messy beginning, Anthea’s brief was to include a swimming pool, entertaining and barbecue area, a new driveway, entrance and sumptuous planting. Anthea’s clients originally envisaged a traditional swimming pool requiring a cover in Winter. They planned to hide the pool at the side of the house. Anthea persuaded her clients that a natural swimming pool would be a much better option. Without the need to cover the pool, it could be sited in full view at the rear of the property. Here it would be an integral part of the garden design and an enchanting focal point all year round. One of Anthea’s main challenges was a preservation order on several large trees in the driveway. 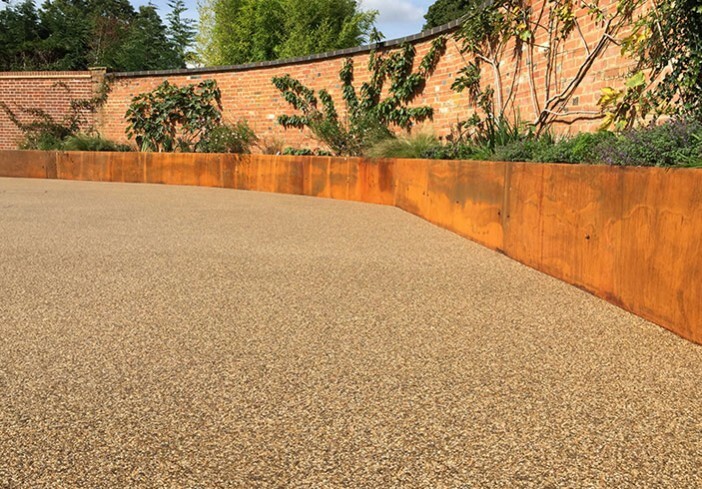 The root protection zone on a stunning Blue Atlas Cedar was enormous and she needed a porous, flexible paving. 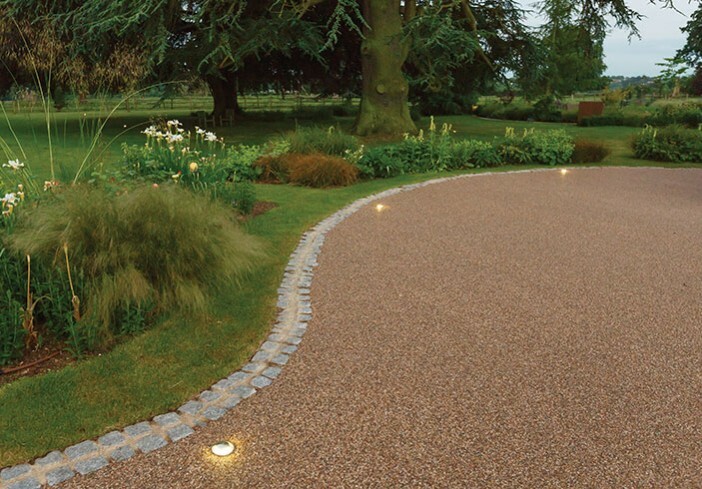 Clearstone resin bound was the perfect solution. Approved by local planning authorities, it’s flexible enough to be laid around tree roots and allows air and water to circulate to the roots. 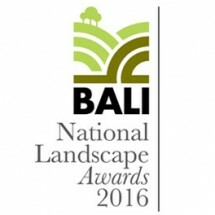 And the judges at the British Association of Landscape Industries (BALI) love it too since they’ve awarded Anthea a BALI Design Excellence Award. They were particularly impressed with how Anthea’s design enhances the property and blends with the landscape, her translation of the clients’ brief and her sensitive response to the preservation of the trees. 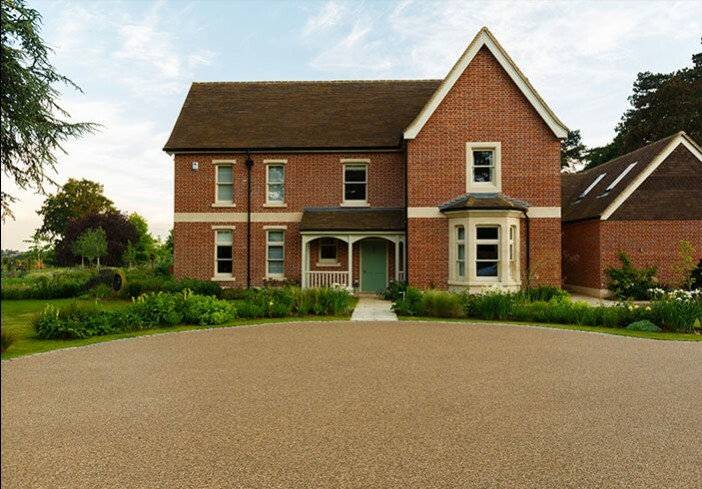 Clearstone’s Marketing Director Debbie Orme is “proud to have been chosen to install the resin bound on such a fantastic project”. 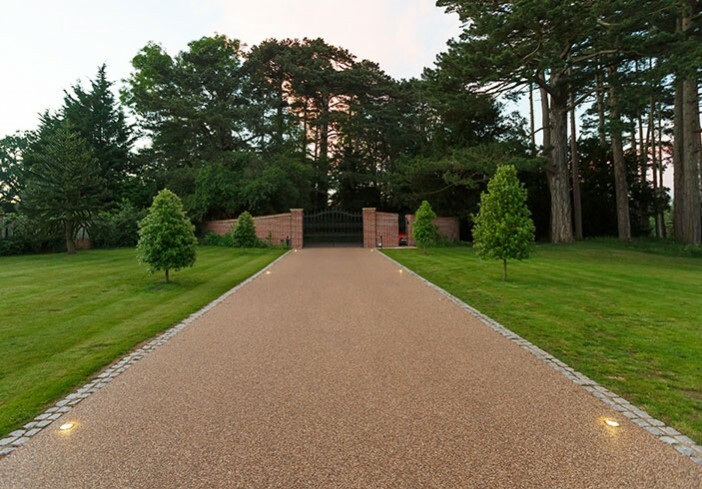 Tree preservation order: Clearstone’s porous flexible paving system created a root protection zone for a Blue Atlas Cedar. 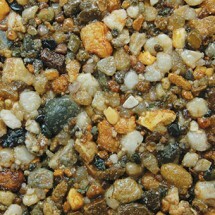 Planning Approval: requirment of SuDs regulations for permeable driveway and paths.